Just the other day +Cass Morrison brought up the question of "when should kids have a phone" and by extrapolation the conversation around what is the best age to give them a digital device? 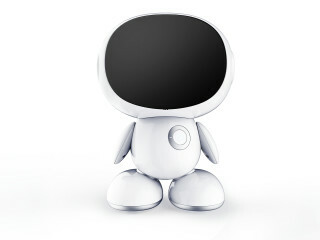 Well, this new product, the "Honeybot"
I don't know why, but I find this little guy super cute... and he runs Android! Personally, I think it might be a little too childish for my 8 year old... but he would have gone nuts for it at 4 (I think my nephew Ashton would love it, and probably drop it less than he has the 2 tablets he's broken already). What's especially neat, especially for that age, is that it can take images it sees to incorporate it into whatever it's showing. Even my 8 year old loves that (like when he plays Draw a Stickman). $229USD (if you get it via the indiegogo time) is a pretty good price for a tablet, and it looks like it'll survive even more than a tablet would. September 7, 2016, Shenzhen, China – HuiYu http://www.honeyhy.com announced today the Honeybot educational robot for kids on Indiegogo at: https://www.indiegogo.com/projects/honeybot-educational-family-robot-for-kids-entertainment-technology#/. An interactive Android-based educational companion robot that uses Augmented Reality for learning, Honeybot is a teacher, storyteller, and a child’s best friend; educating kingergarten and elementary school children ages 3-8 with general knowledge, fun, fantasy, and good daily habits. Made for at school and home use, Honeybot is controlled remotely through a smartphone, creating a new way for parents and teachers to educate kids for a head start in early education. Honeybot employs 3D Augmented Reality (AR), Image Recognition, and Color Extraction Technology with educational apps to tell stories, teach, sing, entertain, and chat with kids -- it even works with all Google Play Store apps. Featuring Daily Timetable and Playtime Controls, Honeybot helps children form proper routines and habits. Over 200 3D audio/video learning materials are provided, covering common knowledge, poems, songs, fairy tales, art, and other courses needed for basic learning for kindergarten aged children. Honeybot creates different voices for asking and answering and can even mimic a parent’s or teacher’s voice for a fun and interactive way to educate or talk to children when parents are away. When playing the parent’s voice, Honeybot will act emotionally, providing Honeybot with human attributes.  AR Aquarium App: 3D drawing app specially developed for the kindergarten educational system by experienced preschool education experts. The app transforms children’s drawings into 3D cartoon animations through image recognition and color extraction technology, helping kindergarten teachers with art lessons and teaching children about marine animals.  AR Yolk World App: an interactive cognitive app aimed at early childhood and elementary school education, it uses the latest 3D imaging to show the child interacting with90 lifelike images of dinosaurs, animals, and vehicles. The multi-angled app provides a real interactive sensory experience, making a big impression on kids (other AR teaching courses are also available).  Simulated Daily Life App: helps kids learn about the proper daily routines, behavior, and raising pets, where children learn how to take care of the little Honeybot for the correct daily habits.  Voice Changing Live Talk: real-time communication between children and parents. The parent’s tone of voice is imitated so children can recognize him or her. Children can also send voice messages to Honeybot and parents.  One Click Synchronization iOS & Android A/V: parents can send audio/video to Honeybot after recording from a smartphone. Over 200 learning materials for 3-8 year olds is provided.  Daily Timetable & Honeybot Playtime Control: Honeybot can activate automatically in the morning to remind children to wake-up. In the evening, it can shift into dormant mode to only tell bedtime stories. Also, after using Honeybot for over 30 minutes when parents are not around, dormant mode can be activated. Honeybot will be available Q4 2016 with a retail price of $349. For a limited time,Indiegogo pre-sale discounted pricing is available for $229-$259 depending on the version. The Indiegogo pre-sale includes the Honeybot robot, charger, cables, AR aquarium drawing card, AR Yolk World card, remote control, and free shipping. For more information, see Indiegogo at: https://www.indiegogo.com/projects/honeybot-educational-family-robot-for-kids-entertainment-technology#/ or the website: http://www.honeyhy.com/.